Their situation may be seen as desperate, stuck as they are in an overcrowded, ship in international waters with food fast running out. But some of the migrants on board the MV Aquarius, plucked out of small dinghies on Saturday night, were filmed singing their praises to the Lord when they wake up in the morning, a Spanish journalist on board has reported. Sara Alonso Esparza recorded the footage of Nigerian Christians singing on board the ship, as Italy and Malta both refuse them space in the inn. The migrants were rescued by a number of vessels in various operations in the Libyan rescue zone and then transferred to the Aquarius. Although the rescue area was closer to the Italian island of Lampedusa than to Malta, Italy declared all its ports closed and newly-elected right-wing Interior Minister Matteo Salvini demanded that Malta take the migrants instead. Malta refused the demand, with Prime Minister Joseph Muscat telling his Italian counterpart Giuseppe Conte in a phone conversation that Malta was conforming to international law. The ship is now idle, some 27 miles east of Malta. The migrants are cramming every inch of its decks, from bow to stern. Aloys Vinard, the Medicines Sans Frontier project coordinator said food will start running out tonight, having earlier said there was enough food for two, three days. 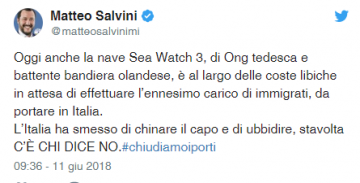 Meanwhile Mr Salvini in another tweet on Monday issued a new warning, to another migrants rescue ship, that Italy would say no to it as well. The warning was made to the Sea Trade 3, currently off the Libyan coast. The Italian Ansa news agency also reported that Italian Prime Minister Giuseppe Conte claimed after his late evening phone call to Joseph Muscat that when he asked for some humanitarian assistance to those in distress on the Aquarius, the Maltese prime minister, despite understanding the situation, did not guarantee any intervention even in humanitarian terms. This confirmed the umpteenth unavailability of Malta, and therefore of Europe, to intervene and take responsibility for the emergency, Mr Conte said. His reported comments contrast with a statement issued by the Malta government late on Sunday, in which Malta said it remained ready to provide humanitarian assistance, as it had always done. Italy, meanwhile, has sent two patrol boats with doctors on board ready to intervene if necessary, Ansa said. Mr Conte said he had also raised the problem of migration at the G7 meeting, and he also insisted that the so-called Dublin regulation must be radically changed. The regulation sets out the rules when people are rescued at sea. 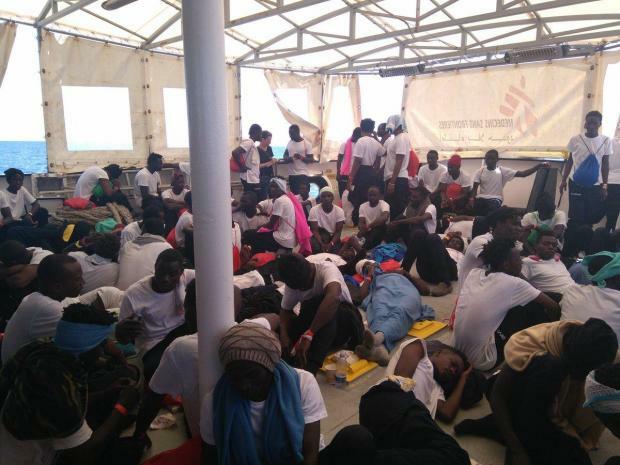 MSF reported that the medical condition of the migrants on board the ship is 'stable for now'. 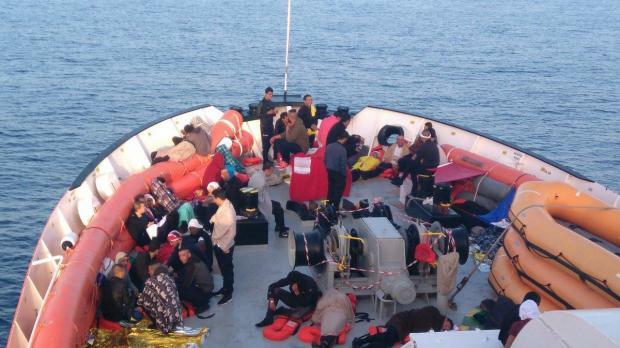 It warned, however, that unnecessary delay to disembarkation would put vulnerable patients at risk, particularly seven pregnant women, 15 people with serious chemical burns, several migrants who had been close to drowning and others who suffered hypothermia.